Owen Jensen was born in Pleasant Grove, Utah. As a young man he worked in the railroad shop in Ogden, Utah. In a 1972 letter written to Paul Rogers, Jensen said that in 1911 he walked 12 miles to Provo, Utah to see the Buffalo Bill Wild West Show. 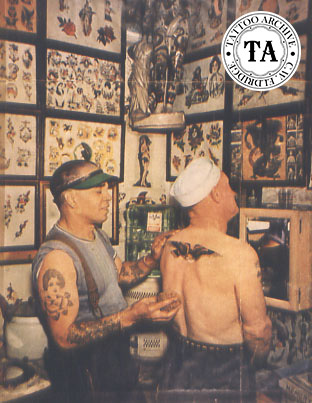 It was there that he saw his first tattooed man, James Malcom, who had been tattooed by Charlie Wagner. Owen Jensen got his first tattoo in 1913 from Bob Hodge on the Lucky Bill Show. That fall Jensen went to Detroit and met J.G. Barber. 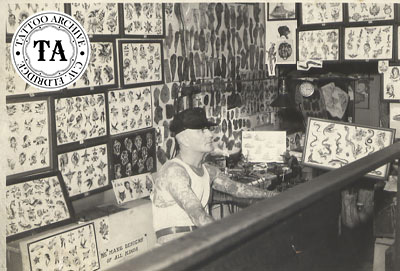 In a 1930s radio interview with the roving reporter Jimmie Vandiver, Jensen said that because he had skills as a machinist he was offered a part time job working in a machine shop making tattooing machines. He was interested in how the tattoo machines worked, and soon learned to tattoo. Jensen did not say what supplier operated that machine shop or taught him to tattoo. J.G. Barber had been in the supply business in Detroit since the 1900s so it could have been him. While in Detroit, Jensen also met Edwin Brown and his wife Sadie. Jensen enlisted in World War I serving overseas and upon his return to the states was stationed near Grand Rapids Michigan. 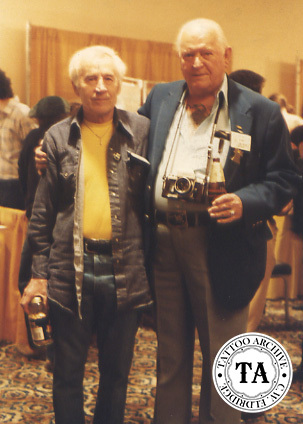 Edwin Brown was tattooing in Grand Rapids at this time and Jensen spent his weekends with him and his wife. Jensen had been tattooing while in the service but during those weekends Brown taught him how to paint flash. When Jensen was discharged he stayed in Detroit for a while working for the Ford Motor Company. When he returned to his home in Pleasant Grove, Jensen built himself a trunk tattoo outfit and hit the sawdust trail. In the following years, Jensen tattooed on several shows and in many cities including, Denver, Casper, Rollings, and Laramie, Wyoming. In 1923 Jensen headed for Los Angeles, California and when he first arrived the fleet was out so he took a foundry job. Shortly after, he was tattooing with Jack Julian at 412 South Main. Jensen did not like that arcade so he relocated to San Pedro and set up shop in a pool hall and worked this fleet town for several years until Charlie Barr ask him to come to work with him back in Los Angeles at 234 South Main Street. Barr was one of the best tattooists of that era and Jensen said that he was very pleased to get such a chance. 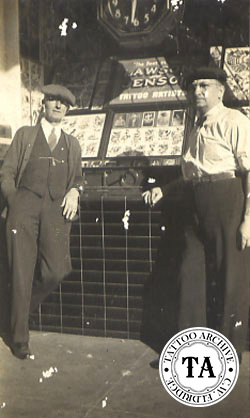 Around 1929, business was not so good and Jensen and Barr split up and Jensen went to Long Beach. 1931 found Jensen in Honolulu for a spell, and then back in San Pedro. But the fleet was on a world cruise so in 1934 Jensen moved back to Los Angeles and started building some machines and selling some of his designs. 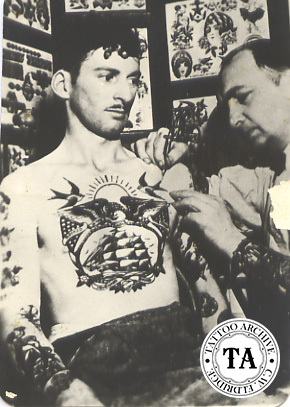 In the spring of 1938 Jensen traveled to New York City, visiting other tattooists along the way. He found a small stairwell in New York to rent and opened up a shop. Wanderlust hit in just a couple of months and he sold the shop to Lou Norman and headed to Norfolk, Virginia where he visited with Coleman, Sturtz and his old partner Charlie Barr. Jensen returned to Los Angeles and reopened on Main Street. Jensen was on the move again in 1940, this time to San Diego to work with Harry Lawson. It was June 1940 when a special delivery letter arrived from Andy Sturtz, telling Jensen he had to go into the hospital and asked if Jensen would work in his shop. Jensen headed east to Norfolk and worked in Sturtz's shop as well as with Coleman. It is unclear when Jensen returned to Los Angeles, but when he did he kicked his supply business into full gear, setting up at #120 West 83rd Street, while tattooing at 243 South Main Street. As the only tattoo supply house on the west coast, Jensen's business was a success, offering quality machines and well-drawn flash. Owen Jensen married "Dainty Dotty", a famous circus fat lady. It is said he also tattooed her, but to date the Archive has never seen a photograph of Dottie's tattoos. Weighing in at 600 pounds, Dotty was not considered the largest woman on record, but she was perhaps the largest female tattooist. Dotty died from a heart ailment in December 1952. Owen Jensen last worked on the Nu-Pike in Long Beach with Lee Roy Minugh at #26 Chestnut, just a stone's throw from Bert Grimm's location at #22. Lee Roy tells the story that Jensen once worked with Grimm at #22 Chestnut, but around 1971 Grimm and Jensen had a disagreement over flash and Bert "ran him off". It was then that Jensen went to work with Lee Roy. At this time the Nu-Pike was past its peak and in a letter written to Paul Rogers in 1972, Jensen was worrying about crime on the street. Jensen said, "I have been carrying my working machines home in a shopping bag. As if I had a nice looking small bag they would think I had money in it and at least hold me up, maybe kill me". In that same letter Jensen said that Lee Roy worked days till 6PM and he worked nights till 1AM. In a 1973 letter he said that it was getting rougher around the Nu-Pike and Lee Roy thought they should start closing at midnight. In May 1975 Jensen wrote, "We still get $5.00 for a name on the arm." In November of that same year Jensen's letter said, "We both carry a small derringer in our pocket while we work." As fate would have it, on July 5, 1976, some young punks came into #26 Chestnut, grabbed Owen Jensen around the neck and stuck a knife in his back. They beat him up pretty bad and took $30.00. They must have caught him by surprise, as he was not able to get to his derringer. Owen Jensen never recovered from that beating and died July 24, 1977. 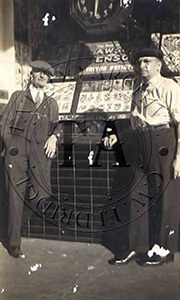 Learn more about Owen Jensen and his supply business in Owen Jensen Supply Catalog found in our online store.